A superb dram from India. 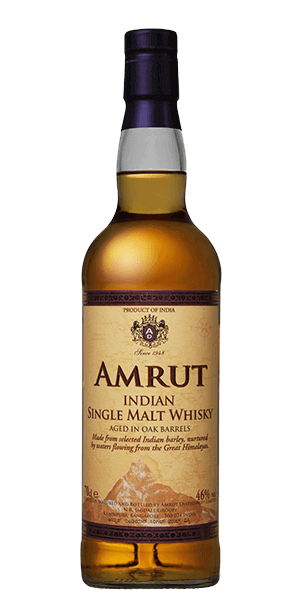 Amrut Indian Single Malt Whisky is made from selected Indian Barley grown up the feet of the Himalayas, matured by the water flowing there and cultivated by old & traditional agricultural practices. It is carefully mashed and distilled in small batches to preserve the natural aroma, matured in oak barrels in unique tropical conditions, at an altitude of 3000 feet above sea level at Bangalore, the garden city of India. This Whisky matures by losing almost half its volume to the angels. What does Amrut Single Malt Whisky taste like? The Flavor Spiral™ shows the most common flavors that you'll taste in Amrut Single Malt Whisky and gives you a chance to have a taste of it before actually tasting it. Distinctly confident licorice-Bourbon notes with near perfect bitter-sweat balance; burnt honeycomb and toffee also abound. Outstanding richness and sheen against the enormous barley-oak sweetness; again there is a big Bourbony cut to the cloth with all the licorice and molassed sugar, but the barley adds that extra dimension. Long, wonderfully layered oak offering variations of a sweet dry theme; a touch silky with some cream toffee in the end. Truly a pleasure. It is a superb dram and one that should be sampled by every Whisky drinker. Prepare to be impressed. My first sample of Indian whisky was enjoyable. There's a lot of oak in this bottle. I've sipped better single malts, but I had far worse also. Now I'm interested. I think "barley-oak sweetness" is a great description of this one. Very smooth, balanced and drinkable. It is tasty and better than average, but not exceptional: I think it is a good value for the price and worth keeping around for its "different" character. Well. I like India, but this is fairly plain. One of the smoothest Single Malts I've tasted. Decent and drinkable. Smooth with a bite at the end. Will Definitely have some more. This is an awesome single malt with massive oak and a good sweet/earthy mix. The caramel, vanilla, and fruity notes come out very well balanced. The spiciness is just right, not too much, and not too little. Very nice whiskey.Surprised by the degree of peatiness.Smooth with honey notes,and a long smooth finish.Very rich in body. Delicious - so strong yet smooth and the deep sherry colouring doesn't prepare you for the almost peaty flavour - and there ain't no peat in India! is a very good rich whisky with birth of oak & burnt honeycomb, a life of barley & molasses, while death is long with oak & creamy toffee. Flat. A bit sweet at the beginning and a poor finish. First Indian Whisky and very surprised. With a bit more age wouldn't hurt. I would purchase a bottle. I tried this in the flavor pack and liked it. Not enough to keep on stock in my bar, but it was nice. A bit antiseptic on the nose.